Elizabeth Arden has a event of Special Buys for Valentine’s Day at Takashimaya Square Basement One. 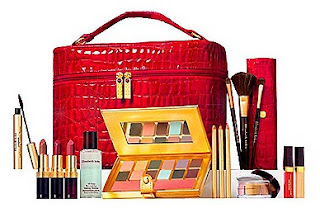 Visit Elizabeth Arden Singapore Website for more information. Elizabeth Arden Holiday 2011 Blockbuster Beauty Box is now on sale individually for S$112. 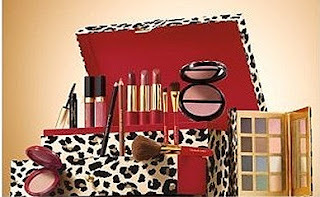 Elizabeth Arden Leopard Chic Beauty Box is on sale individually for S$89. Hada Labo offers free sample of Hada Labo Super Hyaluronic Acid Hydrating Lotion. Redeem your free samples at their facebook page. 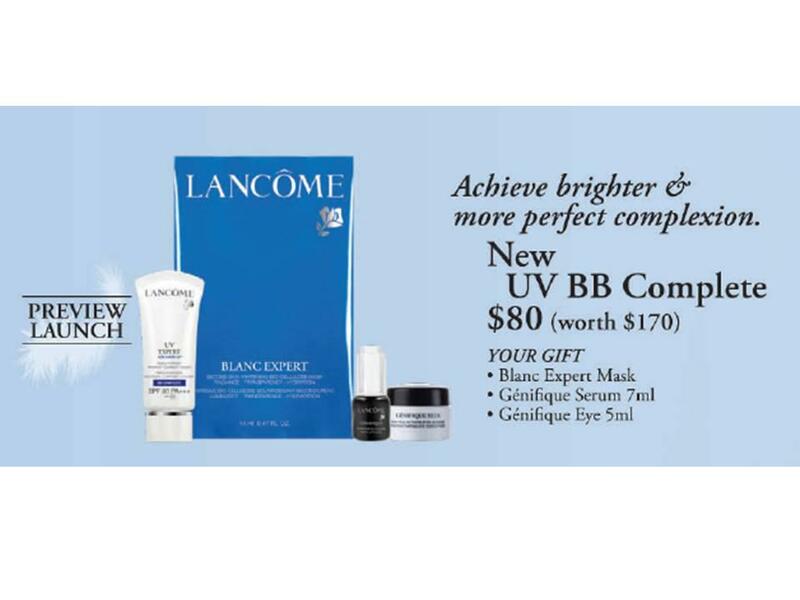 Lancome has a preview launch of their new UV Expert BB Complete. Get yours at Tangs from now through Feb 9 to receive a 3pc gift. Luxola.com is having a lucky draw on BY TERRY purchases. 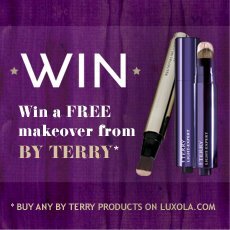 Just make any purchase on BY TERRY products and stand a chance to win a free make over. Valid through February. Paul & Joe is having a Sale of Beauty and Designer fragrances is also now on at Takashimaya Square Basement one and Isetan Scotts Level 3 till 12th February and 9th February respectively. Products available include Christmas 2010 Collection, creamy compact, lipsticks and lip gloss, nail varnish, body mask, and facial treatment mask $30. There is also limited quantity of branded perfumes available. 3Lab offers a $40 valued 3Lab Perfect Lips with any 3Lab Purchase of $75 or more. Use code 3LABFEB2012 at checkout. Valid till Feb 29. Ask Derm offers 20% off entire order. Use code 20P701 at checkout. Bobbi Brown offers free shipping and a 3ml mini Lash Glamour Extreme Lengthening Mascara with any order. Use code HEART12 at checkout. Valid till Feb 12. Clinique offers free shipping with any purchase. You can choose one deluxe sample at checkout. No code needed. Valid till Feb 12. Dermstore offers 20% off Clinician's Complex products. Valid till Feb 12. Hautelook is currently having a sale of Urban Decay. Kate Somerville offers free travel-size of TrueLash Lash Enhancing Eye Makeup Remover with $75 purchase. No code needed. Valid till Feb 8. 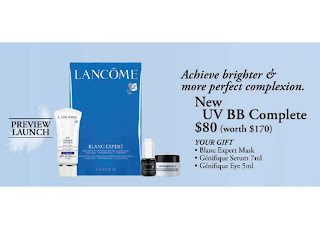 Lancome offers free shipping and a sample duo with any order. Samples include Bi Facil Award Winning Eye Makeup Remover 50ml and Hypnose Drama Mascara dramatic lash volume in black. No code needed. Valid till Feb 12. L'occitane offers free shipping and a Best of L'occitane set with $25 purchase. Enter code MOUGINS at checkout. Valid till Mar 6. Philosophy offers a free tote bag for purchases of $50 or more. Enter code tote4me at checkout. Feelunique.com offers free Clarins Limited Edition Cleansing Trio worth GBP20.85 with any two or more Clarins products purchase. Gifts include Cleansing Milk with Alpine Herbs 100ml, Toning Lotion with Chamomile 100ml and Gentle Make-up Remover Lotion 30ml.